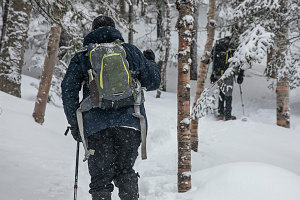 Today was meant to be a larger outing, with a bunch of folks from my work (I've been hoping to take a larger number of my co-workers on some Adirondack winter hikes). 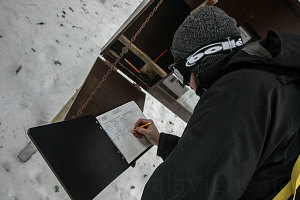 However, the weather forecast had been a little too uncertain. 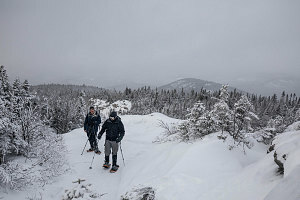 I still really wanted to get out and see what things were like (and it had been a few months since my last ADK outing), so I sent an invite carefully stressing that it was very possible we'd be hiking up into blank white no-views cloud. Two of my work colleagues (and friends) -- Gino and Chris -- were good with that possibility. The forecast was for a mainly cloudy and fairly cool day, with a slight tendency for clearing at the end of the afternoon. As a result, we chose something short and drove down such that our hike started quite late - at noon. Given our late start -- and given that this was Gino's first Adirondack hike, we chose something short: Hurricane mountain. Plus I hadn't been up Hurricane recently, especially from the south side. In fact I hadn't climbed that way in quite a long time, actually - the last time being way back in 2004. It was cold and cloudy as we arrived at the route 9N trailhead for Hurricane. Owing to the late start time, there was already a full string of cars at the parking lot. In a way, that was good - there had been a huge snowstorm only a week before and I didn't really want to introduce Gino to a hike where trailbreaking was required. We started walking shortly after noon. The trail was suprisingly firm and well-packed. 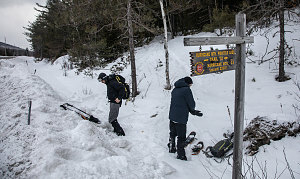 Even so, we put the snowshoes on right away to continue to improve the condition of the track. Right away, I noticed that there seemed to be a few more twists and turns in the trail than I recalled from the last time I hiked this trail. Some switchbacking, some back and forth. And after a few minutes there was even a nice little lookout. Seemed like this initial bit of trail had been re-routed. Nice. After an initial 300 feet of climbing, the trail flattened out. We continued for quite a long time like this, crossing a large mostly flat shelf of land to the south of Hurricane Mountain itself. This part I remembered from my older hikes, and in general the route here seemed unchanged. 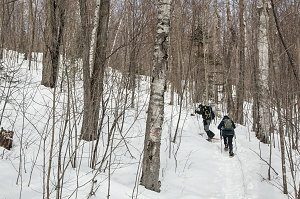 The trail passed by a number of flat marshy areas -- now blanketed in a thick white layer of snow -- which gave us a look up at the skies. There were a few minor hints of blue here and there. After trekking across the flat terrain for about half an hour or so, we began climbing up again, this time through open forest. 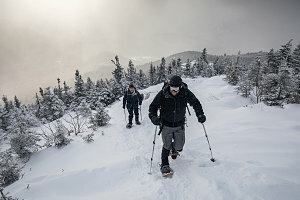 I told Hatko and Gino to be ready for some steep trail ahead - I remembered that as the route neared the summit, it went straight up. Up we climbed, over easy grades and avoiding any difficult steps. The predicted steep stretch, however, didn't come. 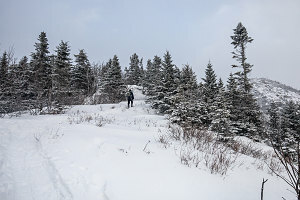 And when we crested the western ridgeline of Hurricane, still some ways away from the summit, I realized that the trail re-route from below was not finished. At no point did the old trail ever follow any ridgecrests. 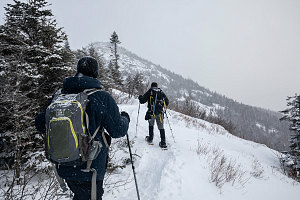 Continuing on (now more or less along or near the ridgecrest), the new trail charted a masterful path, avoiding any thick forest and exploiting just the right weaknesses in the terrain to allow for a mostly constant and relatively gentle uphill grade. 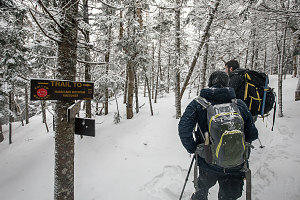 It was clear that this had been no minor re-route around a few problem areas, but instead had been an entire re-thinking and re-layout of the Hurricane Mountain south approach -- similar to the trail re-route that had been done on nearby Jay Peak some years ago. 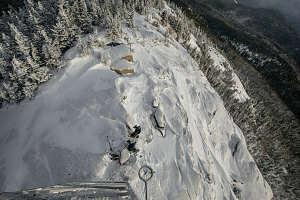 At the top of one steep snowdrift, we popped out onto a beautiful open ledge. The summit block, still some way away from us, was quite prominent and attractive from here. 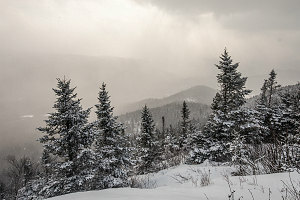 Weather-wise, there were some light flurries and lots of low, puffy clouds. We could tell that the sun wasn't far away, though, as various glowing bits of sky attested. The new trail continued along bits of open ridgeline, dipping back into the cover of thick fir trees whenever there was a dip or hollow. 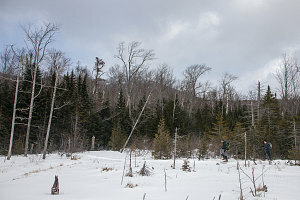 Each offered some sort of view of the approaching summit block, as well as excellent views south to the Giant Mountain area and back west towards the Great Range (both of which we couldn't see at the moment because of visibility). Still, we could see enough to know that these were great lookouts. A final dip back into the ridgeline's forest brought us to a junction with a different approach trail coming from the north. From here, we followed pre-2014 trails, and I started to recognize landmarks. 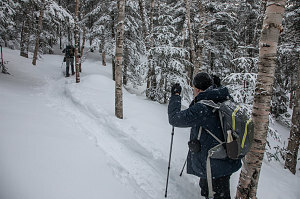 I noted the spot in the forested notch where the old now-abandoned southern trail came in, and then up the steep step to the first of the exposed bedrock that marked the start of the open terrain on Hurricane's summit. 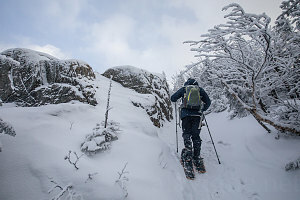 It head been very slightly snowing as we had hiked along the upper ridgeline, but as we now climbed a couple of slightly icy steps to the beginning of open bedrock on Hurricane's summit, that had stopped. It was actually very still at this point, with virtually no breeze at all. Some new blue patches had moved into position above, but as of yet, there was no sun shining directly on us. The late afternoon partial clearning might actually happen, I thought. 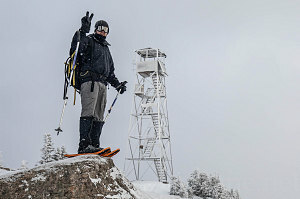 Atop Hurricane sits an old fire tower, used way back in the days before forest fire patrols and sightings were done using aircraft. The frosty outline of the tower's girders could now be seen not far away. We clomped over the thinly covered open bedrock toward it. 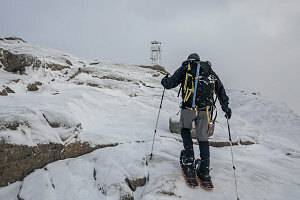 We walked up to the summit (and the base of the tower, since it sits directly on the summit), and dropped our packs and snowshoes. I was curious to explore the tower, since in all of my previous climbs to the top, the tower had been closed to the public. Some time ago it had been restored to the point that access was now permitted. A faded "maximum six persons at once" sign marked the only restriction. 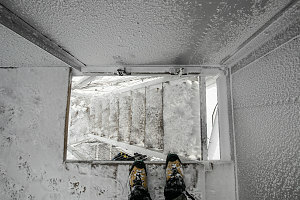 Carefully navigating the frost-covered steps, we (Hatko and I) made our way to the top. 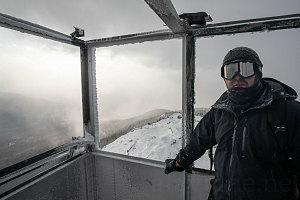 Although Hurricane already has an excellent nearly 360-degree view from its almost entirely bare summit, the fire tower gave us a cool and unique perspective. The sun started to illuminate the summit of Hurricane as we stood in the tower. 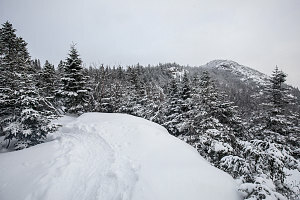 The thin fresh snow covering the open bedrock made the summit glow. Below us, we could see a band of snow showers approaching, back-lit by the sun. 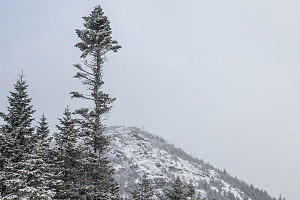 There was still a thick cloud deck in the direction of the Central High Peaks, so we had no views in that direction. 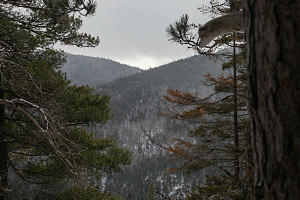 To the south, however, Giant and surrounding peaks were visible, and the lower lands to the east, towards Lake Champlain and Vermont, were also visible. It was perhaps the best we could have hoped for, given the weather. 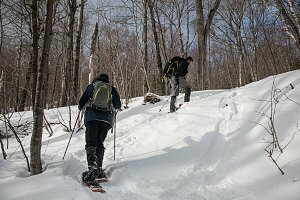 We had felt pretty good, temperature-wise, as we had climbed up from the car to the summit. 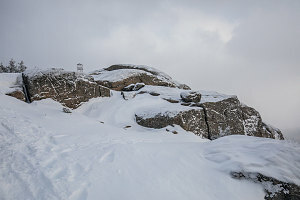 But up here at the top, the temperature was distinctly colder, probably pushing below -17C / 0F, and a small but very chill breeze had begun to blow. Plus we weren't moving any more, not generating any more heat. It wasn't long before we were starting to get a little bit uncomfortable. Time to head on down. 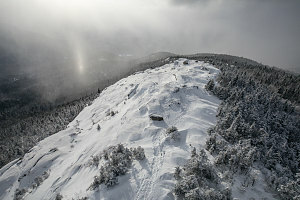 The approaching band of flurries held off enough to give us a few more minutes of pretty summit light. 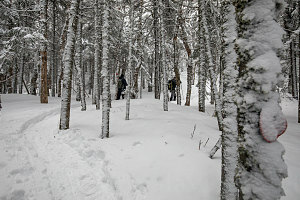 Then it was back down into the fir forest along the western ridgeline.